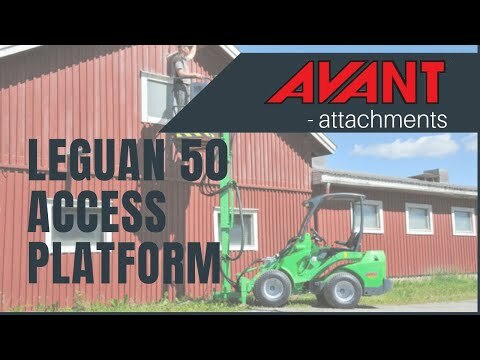 Leguan 50 Access Platform - Reach It! - Move It! - Crush It! Avant and its daughter company Leguan Lifts have joined their forces and created an acces platform which is mounted directly into Avant loaders quick attach plate. The result is an inexpensive, handy and easy to use acces platform. With the help of this lift Avant’s versatility is further increased on the job sites. The Leguan 50 is mounted directly on to Avants quick attach plate like any other Avant attachment. This makes it fast and easy to mount it on and take it off. The lift is designed according to all access platform directives and it is CE-certified. The safe working load for the lift is 200 kg which means it is allowed for operation with two men or one man with plenty of tools.